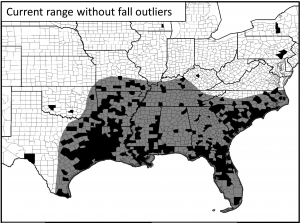 Seminole bats are migrating farther and farther north, most likely because of climate change. Photo by Libby Porter, Wikimedia Commons. Over the past 48 years, Seminole bats (Lasiurus seminolus) have drastically expanded their range. The western range is also expanding, possibly because forests are replacing historic grasslands in many areas. The western edge has advanced by 115 miles. Seminole bats migrate with the seasons. During the winter, they are found along the Gulf Coast and in southern Arkansas. In the spring, they move northward and can be found as far north as Kentucky and central Missouri by summer. The summer edge of their range is expanding the farthest, although their winter range is also expanding. Based on collection records, the current distribution covers the eastern third of Texas, northward to Missouri and eastern Kentucky, and eastward into the southeasternmost corner of Virginia. Perry reviewed more than 1,500 records from museums, universities, peer-reviewed journals, state wildlife agencies, and other sources. Some date to the 1800s. From the 1800s until 1970, the distribution of the Seminole bat was stable. After 1970, Seminole bats began migrating farther and farther north, and by 1985, their range expansion was well underway. The shift began long before white-nose syndrome’s deadly march through the U.S., so increased sampling efforts conducted in response to white-nose syndrome are not a sufficient explanation. The current Seminole bat distribution is shaded gray. Black indicates counties where the species has been recorded. His findings were published in the Journal of Mammalogy. In Europe, bat species are also expanding northward, as other studies have shown. In the U.S., three species – Mexican free-tailed bats, evening bats, and tricolored bats – have also expanded their ranges recently. Climate change is the likeliest cause. Average temperatures are increasing, and most of the warming has occurred since 1975. Seminole bats reproduce in the summer, and by fall, the young mature and become independent. Some of those young bats wander many miles outside their regular range. 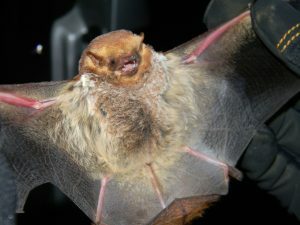 In autumn, Seminole bats have been recorded in unexpected locations, including the Caribbean, Wisconsin, and New York. Perry’s distribution maps do not include these autumn outliers. Seminole bats occasionally roost under leaf litter or in deciduous trees. 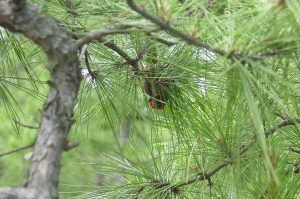 But they most often roost in pine trees, rather than Spanish moss, as once was thought. Photo by S. Andrew Carter. Between 1970 and 2018, their winter edge grew northward approximately 70 miles in the western portion of their range and approximately 186 miles along the East Coast into North Carolina. “Anyone sampling bats in these newly occupied areas should be aware of the potential occurrence of Seminole bats – especially since the eastern red bat is a lookalike,” says Perry. Seminole bats have mahogany brown fur with white frosting. And like other members of the Lasiurus genus, their tail membranes are covered with fur. For more information, email Roger Perry at roger.perry@usda.gov. « Older Previous post: Study Supports Single Introduction of Laurel Wilt Pathogen in the U.S. Newer » Next post: Can Southeastern Bats and Rock Climbers Share Cliffs?